The Citi Executive / AAdvantage World Elite MasterCard, American Airlines’ premium co-branded credit card, currently has a special offer available. Under this promo, you’ll earn 100,000 bonus miles when you make $10,000 in purchases within 3 months of account opening. Plus, you’ll earn up to $200 in statement credits on purchases made within 12 months of account opening. Compared to the standard offer available on Citi’s website–which offers 30,000 bonus miles after spending $1,000 in the first 3 months–this is a fantastic deal, provided you can meet the spending requirements. There is an annual fee of $450, for which there is no waiver. Admirals Club membership privileges – With an Admirals Club® membership, you and your immediate family (or up to two traveling guests that accompany you) have access to over 40 Admirals Club® worldwide locations. Lounges offer complimentary drinks and light snacks, complimentary Wi-Fi, conference rooms, PCs with Internet access, print services and more. For a list of Admirals Club lcoations, see http://www.aa.com/admiralsclub. Enjoy access to dedicated check-in areas at ticket counters, airport screening lanes and boarding privileges where available. Receive a 25% savings on in-flight food and beverage purchases when you use your card. 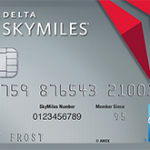 Earn elite status faster – You’ll earn 10,000 AAdvantage elite qualifying miles when you reach $40,000 in purchases in a calendar year on the card. Full elite status qualifying requirements can be found here. Earn 2 AAdvantage® miles for every $1 you spend on eligible American Airlines purchases, including airline ticket and onboard purchases, and 1 mile per $1 spent on everything else. For more information on this offer or to apply, see this link. Note: On the landing page linked above, it appears that you don’t need to enter a referral code or airport code. Leaving those blank still allows you to proceed to the application.